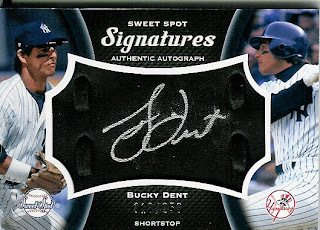 Upper Deck’s Sweet Spot and Sweet Spot Classic have been a staple in the Hobby for several years. During that time, collector sentiment has ranged from elation to confusion, as the product formula has transformed over the years. The recent announcement that Upper Deck will be retiring the Sweet Spot brand for 2009 has been equally met with emotions ranging from confusion to anger as comments and posts on message boards and blogs can attest to. Am I the only person who heard Chris Carlin say on Superfractor.com that Sweet Spot is going to come back in 2009 after all?